Well 2011, you were a heck of a season! On Sunday, I closed out my season racing the Muskoka 70.3. The race itself, is set in stunning terrain with no limits to finding beautiful scenery. For anyone who has questioned whether they should race this one, I say do it! !…but consider yourself warned! I went into this race thinking I was racing something comparable to Timberman and boy was I wrong. I love a good challenge and I found one. This was not my “A” race for the season, so basically my plan was to go run on fitness and do a solid race, but not worry too much about the seconds. 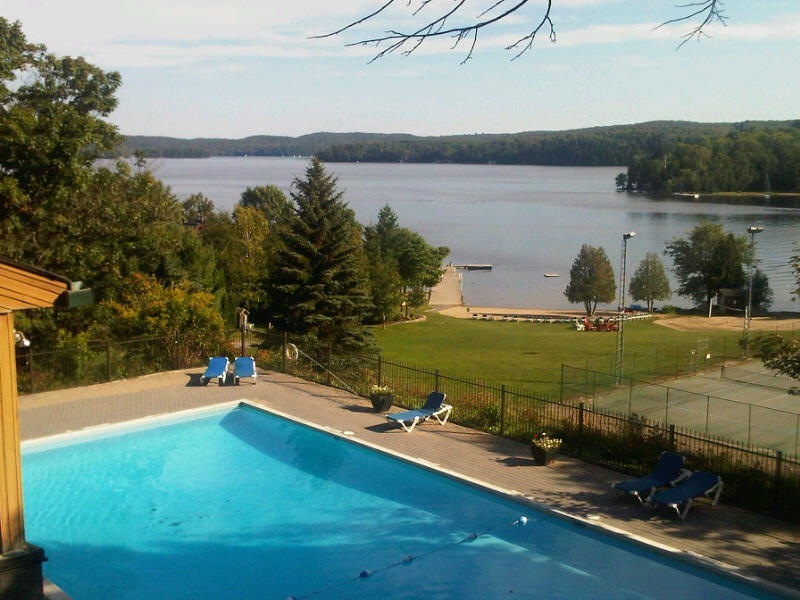 We stayed at a resort called Hidden Valley which is walking distance to Deerhurst. The Swim – 37 mins 20 seconds. 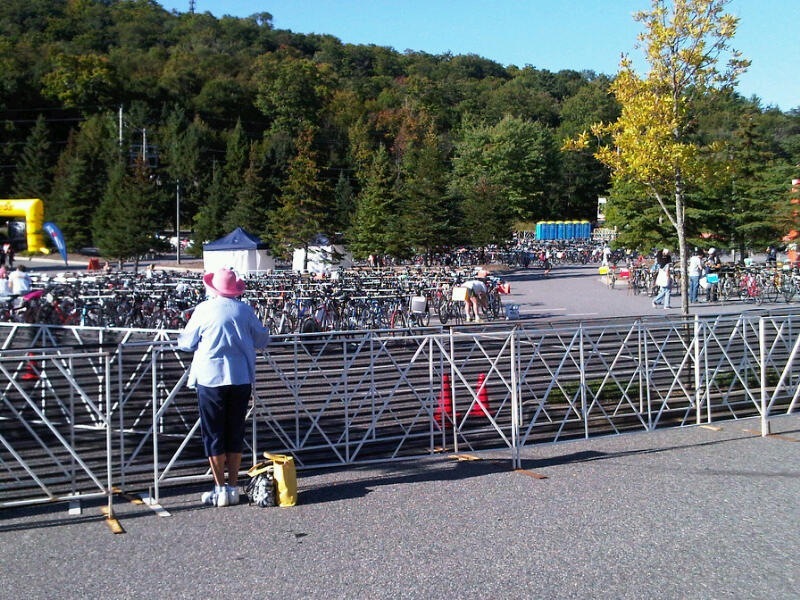 The swim is quite a walk to enter the water and a pretty good jog to get to your bike. If you do this race, I recommend taking a pair of shoes and dropping them at the Swim exit. My swim wave started at 8:30 am, so we entered the water around 8:24 am for the warm up. I had been having some GI issues that morning so was a little concerned about what was to come. When the wave got the “Go” call, I found it much more aggressive then swimming at either Ironman Placid or Timberman. I literally had people boxing me in, but the trouble was they were not faster then me. So I got stuck and this tells me that people did not seat themselves correctly. I had to literally fight my way through and it really irritated me. This got me off my game slightly but once I got through the initial crowd I was fine. I settled in and found my rhythm with no issues finding the markers or buoys. The swim went quite quickly, and it seemed like no time we were on our final approach in. As I was coming in, about 200 meters I noticed the water started getting shallower. I adjusted and started pulling my stroke slightly to avoid running my hand through the mud. It got worst…suddenly…I was literally inches above the mud! I had to stand up and run for about 10 meters before the water got deep enough to swim again. This messed me up a bit, but more so just frustrated me. I swam strong to the exit and got the heck out of there. T1 – Long run, has to be about 300 – 400 meters. Got up there finally and out onto the road in 4 mins 14 seconds. The Bike – 3 hrs 5 mins. I was trying to switch back to some speed after training for Lake Placid all spring and summer. Having pitched in a Olympic and a couple of TTs, I knew my legs were still not back to last summers Top End. But again…that was okay…it was not my “A” race. Brilliant Plan! What I did not do, was focus on hills. After Placid, I basically backed off hills completely and tried to switch back to speed. In hindsight, what the hell was I thinking? It’s Bloody MUSKOKA!!!!! This bike course is awesome! It’s got great scenery, so clean and fresh, but the hills are relentless and they keep coming. I pushed my way through the course using both experience and fitness, but not too much of the speed work I had been attempting to win back. I did manage to break my own personal speed record of 69k/hr on one downward hill. This course is 94 KM which is slightly more then a normal 70.3 distance and you will notice it. My strategy became simply to watch my heart rate, spin-spin-spin on climbs and use the down hills as much as possible. I came in slower then I expected…feeling pretty good. T2 – 1 min 54 seconds. My legs cried for joy! Fumbled with a gel and water, slipped my shoes and hat on and off I went. The Run – 1 hrs 48 mins. I love to run, but trying to run my normal speed was not going to happen. My quads and hamstrings had been punished on the bike and I knew that I was just along for the ride at this point. I’d take whatever they gave me and I was going to enjoy the rest of the day. Um…yeah. The whole first part of the run is pretty much up hill with some pretty solid grades that will cause you to pause. To get through the run, you need to be able to focus and put this in perspective. Do not assume it will be a breeze but it’s not impossible either. I was pretty fortunate because I somehow ended up running beside a woman who was pretty much stride for stride with me. We chatted and occasionally moved ahead and behind each other, but stayed pretty solid through the first 10K. At the turnaround, my best friend Dale ( who was ahead of me ) and I crossed paths. He exclaimed “You got me, I’m dying”. I yelled back to him that he was not dead yet. I will admit though, I had a rabbit and I was chasing him down. I caught up to him around the 13K mark and as he congratulated me and slapped me on my back..I rolled forward staying focussed. It was warm, and the terrain was very rolly which added to the burn in my legs but I was not going to stop! The final 4 K of the race have you go back though a valley and then back onto the main road into Deerhurst. It’s here, that you can see and hear the resort and finish line. It’s also the last big downhill and climb you will have to do so adrenaline will get you through this section. Running through the crowds, one of my good friends was smiling and gave me a high five. It’s worth mentioning, that she recently completed Ironman Canada!! Running in the chute seems to last forever, but all of a sudden..its over. I crossed with a total time of 5 hrs 37 minutes. No PBs on that day, but a good solid race and I am happy. Would I do it again? I think I would, but there are some others calling my name. It’s unlikely I would ever use that race as my “A” race or to qualify for Vegas but I would definitely use that race to train up or just to have some fun with friends. In my previous post, I spoke about my coaches words and how I was going to try and let it go. I am very happy to report that for the most part, I was able to to just have fun. More or less anyway….but I know where to find my minutes….